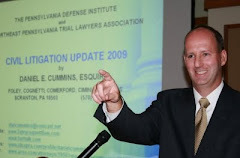 Meanwhile other local reports indicate that former Judge Conahan has been moved from the Philadelphia Detention Center where he has been housed since his sentencing. According to the Federal Bureau of Prison, Conahan is listed as "in transit." It is anticipated that future news reports will reveal where he has been transferred to in order to serve out his sentence.